Conventional wisdom tells us the story about most sequels, and it tells even more about those who review sequels. Many sequels are made on some sort of auto pilot that just applies more explosions, more speed, more money into the same story. More reviewers head into sequels already knocking a point or two off of their rating. It almost takes an act of Congress to restore it. 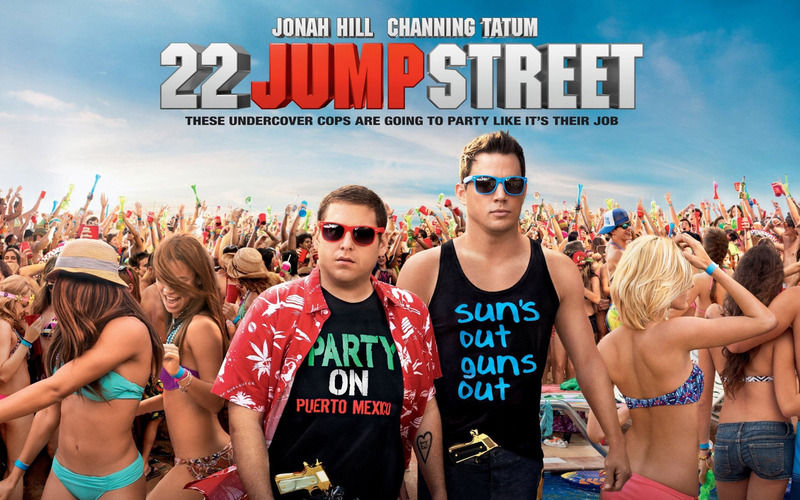 To be completely honest, my want to see the 2nd Jump Street film was not as high as it probably deserved. They were coming back with the same team of stars, directors and writers. What could go wrong? For this reviewer, its been Jonah Hill fatigue. His film work lately has received more praise than it was worth, and the debacle of his use of homosexual slurs had me tired of his over apology. He knew it was stupid to say what he did. He knew more the financial cost of not bending over backwards to appease those who might be offended by it. The whole thing stunk as insincere. Give me Shia LaBeouf any day. There’s a guy who knows how to avoid going to therapy just because he went on a bender in NYC. When it came down to it, 22 Jump Street looked like the only film fellow reviewer WeMissE and I had not seen either together or separately, so that was that. Good decision by elimination. This time around, with the guys going to College instead of High School, it was better than the first. Mainly it was self awareness that allows it to be so. Much of the talk in the beginning centers around the coincidence of their new location, along with management’s desire for Schmidt and Jenko to just do what they did the first time around. Some of the early references fall flat, but it’s the long game that counts and that is where everyone succeeds. The story, in short, is about a new drug called WhyPhy (wifi). A college student is dead from its effects, and for some reason, just like the first time around, the police has caught up to this drug in it’s first location – fictional college MC State – and they know the dealers plan to go National from there, even if they don’t know who the dealers are. Such moments remind me of the speaking while driving segments of the Lethal Weapon films. We need exposition, and for the film makers, there are better things to do than mine that out of the story naturally. In the Jump Street films, the better things to do is provide comedy. Do they ever provide comedy, though. The main trio in these films, Hill, Ice Cube and especially Tatum, are perfectly cast for their roles. It’s as if everything in their acting life has lead them to this point, and the result is pure magic. Their performances once more match almost perfectly with that of the scribes and directors. There are moments that might stretch too far, like Cube’s meltdown at the dinner buffet, but if anything, the wisdom was to alter the course just enough so that what we expected to be stale is different. Even better, the chase scenes and the violence were actually scaled back, making them seem a tad more realistic, if that is at all possible. Among the highlights in supporting cast, most prevalent is Bell. Her deadpan delivery works exceptionally. Her remarkably awkward scene with Hill towards the end of the film is pure magic. There are the Yang twins in the dorm across the hall, played by The Lucas Brothers. Every moment with them is funny, and even better, it brings another element to Schmidt and Jenko, playing brothers who are so completely different. The wise decision to make the point that Schmidt looks much older allows for a potentially worn out joke to breathe and as a result, be funny. It’s nearly impossible to picture Peter Stromare as anyone other than Karl Hungus from The Big Lebowski. Even so, he is not really on the screen enough to distract from the story. If anything, it’s better having him there because a stock character needs to be played by a reliable character actor. This is indicative of the strength of Lord and Miller as filmmakers. They are not reinventing the wheel in any way with their work. They just make it a little wobbly, and thereby more entertaining to watch. If they excel at anything other than turning convention into a weapon, it’s pacing. There is never a moment that we spend thinking about anything other than what is happening on the screen. The best example of their continued magical chemistry with the writers, Bacall especially, is the pondering of drugs today versus those used by The Golden Girls. Tatum is a decent actor, but he’s never been close to as effective in any of his other work as he is here. Jenko is a rare bird: a person at war with his brain. He keeps expecting it to work for him, but at crucial moments, it just doesn’t. The key is not overplaying it. Other actors might play him as a buff, but functional retarded man. He is just short of the Pain and Gain guys, but he is capable where one might expect. This time around, he finds someone who fits his personality like a glove. Zook, played by Goldie Hawn and Kurt Russell. The interactions are not forced and seem just enough for a couple of kids who were made for college sports, and not much else. Hill, for what it’s worth, is back in his wheelhouse. It’s not that he isn’t good at dramatic film-work. He is just not as good at it as the press would have one believe. This will probably play itself out in 2 or 3 years, and his opportunities might diminish a bit. He’s made brilliant choices on who to work with so far, and the press has loved him for it. There are only so many times you can play the same quirk. Ice Cube has something that no one else can do. His skill is much like Charles Barkley’s. Who else can give an explicit insult to “Korean Jesus” in one moment and then sing the praises of the “Vietnamese Jesus” the next? Making him a father is a stroke of genius. Making him the father of a college age kid is beyond genius. Just wait to see who the mother is. It’s unclear whether there will be a genuine sequel to this film. Given the hilarious sequence of sequels they roll out with the credits, it might be a bridge too far. My favorite is 33 Jump Street: Generations. After that brilliant sequence, they’d be foolish to try to top it. Then again, I thought they would be fools to try to make a movie out of such a conventional show, so many years after it was over. These guys can do a lot with convention.